Dealing with a loud, rude, obnoxious, assaultive person can and will be challenging, and this video is a great example of keeping your cool with someone like that to avoid escalating the situation. So I stated that this video is a great example of someone keeping their cool to avoid escalating the situation, and you may be wondering just how much more escalating can there be?! Well, the loss prevention officer could have lost his temper and really put the beat down on her, especially when she tried to knee him in the groin. The loss prevention officer kept his tone of voice pretty controlled, he had a raised tone of voice but he never lost control, he didn’t just start yelling at her. He had the presence of mind to give her verbal commands in an effort to de-escalate her, telling her to stop resisting, to wait for police, explaining to her she can not be shoplifting and that the police will come and deal with it, and then she started to physically assault him. He did not put the beat down on her, even after she tried to knee him and took several swings at him, he used enough force to keep her under control and detain her. Even as he physically restrains her he is then yelling at her to stop it, to stop resisting and fighting. The suspect’s actions is very common in my experience, they will create a commotion, they will accuse and blame the loss prevention officer of “starting it”, just like this girl was accusing the loss prevention officer of having assaulted her first in the parking lot, totally ignoring the point that she is shoplifting. Shoplifters will create a scene and act like a victim, and even in the video you see one person attempt to come to the girl’s aid. That person is held back and because of her actions the LP officer asks her if she knows the suspect. You can also hear a person calling out for the LP officer to just let her go. 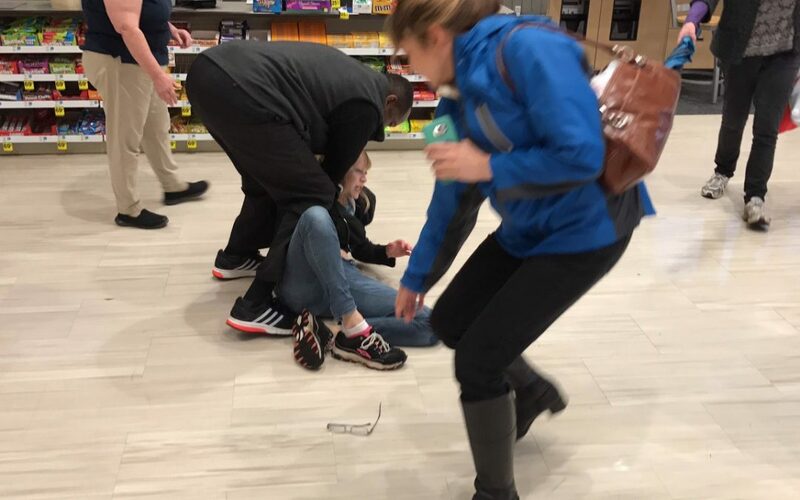 In my experience shoplifters learn that if they can create a big enough commotion, even play the race card, they will more often than not be left alone because LP officers and by-standers are afraid to follow through and attempt to detain a person. This LP officer apparently went out to the parking lot to make contact with this girl and then brought her back into the store. I thing that is AWESOME. One thing was a pet peeve of mine as a police officer was dealing with corporate rules that spelled out that LP officers and employees were not to follow suspects under any circumstance or even go hands on with someone under any circumstance. At least that was how the rules were explained to me. I always encouraged the LP officers and employees to, at the very least, go to the door or window and watch and see what color vehicle the suspect or suspects get into and which direction they went!! Just THAT often times would be all the responding officers needed to catch the bad guys! And I would like to see corporate rules adjusted to give their people the option to get physical with a subject if the situation warrants it. For one thing if LP makes contact with a subject and that subject immediately starts to physically assault the LP officer, the LP officer should now have the leeway to defend him or herself and to take down the subject, who initiated the physical contact in the first place. That’s just my humble opinion. Too many bad people have learned that all they have to do is create a loud commotion or active aggressive and hostile and they will pretty much be allowed to leave peacefully. So back to the video, just an awesome job by the LP officer of keeping his cool, did what he could to de-escalate and detain, and used just enough force to stay in control. This comes from confidence in yourself and what you are doing and why, and that confidence can be gained by realistic and consistent training. Contact me about training your team or staff to develop the confidence to deal with a difficult person! What if you have a child and live with a girl like this? Forgive me, but I am not sure I understand your question… What if you have a child and live with a girl like this? Are you saying you live with a girl who tends to get loud and lose control in front of your child? Are you saying that you have an out of control child and it is embarrassing because you live with a girl? The context of the question is critical for a proper answer!